(As with all Readers’ Guide Questions, it is strongly suggested you not read these until you’ve read the story.) 1. 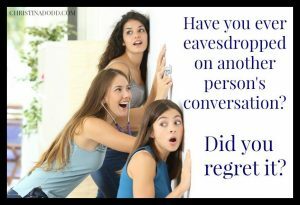 Have you ever eavesdropped on another person’s conversation? Did you regret your actions? Why or why not? 2. Cornelia speaks about her early desire to please her mother. Talk about a time in your life when you felt pressure to conform to the expectations of another person. What were the expectations, and how did you cope? 3. Have you known someone with autism, OCD or who generally could not understand nuance, sarcasm or jokes? What was your reaction to this person? Were you able to forge a relationship with them, or did their routine and/or reactions to social situations stand in the way? 4. How did you feel during the scene where Cornelia attempts to tell the Sheriff about her findings? Did you understand his reaction, or were you frustrated by his inability to look past Cornelia’s crime of hacking to the possible crime of murder she was reporting? 5. Cornelia reacted very little to her realization that her husband wanted to poison her, and she was able to think quickly in turning the poison on him. Do you believe a person with a “normal” demeanor would have fared as well? What would your reaction have been? 6. What were your feelings when you realized that Mason had died in pain? Do you believe he deserved it? Why or why not? 7. Do you understand why Cornelia returned to her routine at the Oceanview Café after her husband tried to murder her and was killed by his own actions? How would you cope with a betrayal and the subsequent loss of your loved one? For a list of all the Virtue Falls series novels and short stories, click here.